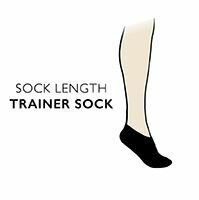 Extra wide at the ankles and with trademarked Easy Stretch for a non-binding fit, ladies SockShop Iomi Footnurse Gentle Grip Diabetic Ankle Socks deliver instant ease and protection from pressure wounds and constriction, with cushioned feet for added comfort. Hand linked toes for smooth seams eliminate the friction and pressure that leads to the rubbing and blisters that can be such a problem for diabetics. SockShop Iomi Footnurse Gentle Grip Diabetic Ankle Socks are made from a blend of cotton, Coolmax fibres, and Actifresh treated to keep your foot environment bacteria-free, cool, fresh and dry.